We return from our summer recess to face and embrace the challenges and opportunities of the new academic year. Our talents will undoubtedly be used to achieve new goals and improve ourselves. However, talent alone is not enough. It has been said that hard work beats talent when talent doesn’t work hard. Hard work itself springs from motivation. While the quest to achieve new goals can be invigorating by itself, all of us have moments when we feel lacking in inspiration. How can we continue to motivate, not just those we lead, but also ourselves through moments of malaise or self-doubt? How can we keep moving forward to achieve our potential? 1. Set small, achievable goals at the outset: Nothing motivates like success. Whether leading a team or working on a project yourself, setting small, achievable goals at the outset will allow you to create a foundation of positive energy you can build upon. Tackling too much at once will sow disinterest and worry. You will judge from your initial successes or failures the likelihood of overall success, and the hardest step is always the initial one. The first task in any project is to write a to-do list and make the first item, “make list.” Then, cross it off. 2. Your attitude and effort are constantly being observed: When being led, people look to leaders not only for guidance, planning, and wisdom but also for your attitude and effort. When leading a team, an upbeat, positive, optimistic spirit can have an infectious effect more impactful than hours of careful planning. The effort a leader puts in and the attitude one shows are the upper limits of what you can ask of anyone else. No one wants to work hard for someone who barks orders without putting in effort themselves. People can run through brick walls if the leader does it first. 3. Mistakes are teachable moments: Eventually, someone on your team will make a mistake. This is unavoidable, but your reaction to this will make a difference in how that person moves forward. By showing forgiveness and understanding that errors happen, and possibly even relating a story of your own, you can inspire your team to work that much harder. It is also critical to not embarrass someone who has made a mistake by chastising them in front of others. Instead, pull them aside into a private conversation. 4. Need to Know Why: Make sure members of your team understand not only what they are trying to achieve, but why they are trying to achieve it. This relates not just to the overall project, but to the individual stages. Passion comes from knowing how and for who things will be different if you succeed or fail in your task. If you are building a wall, what room is it for? If you build a house, who is it for? We wish you nothing but success and accomplishment as you head out into the new year. Your motivation will keep you and your team moving in your darkest hours of doubt. It is not just logical thinking, but emotional investment which will be a key to your long-term success. Picture yourself at the end of your journey, whether it is academic achievement, athletic honors, charitable works, or a goal of your own choosing. Your ability to inspire yourself, and others, will be the most important element. Continue reading below in the Monthly Motivation section for 5 Ways To Stop Self-Doubt From Crippling Your Motivation. The NSLS Scholarships and Awards Program supports members for their dynamic leadership, service, chapter/member excellence and financial need. During the 2018-2019 academic year, the NSLS will distribute over a quarter-million dollars in scholarships and awards exclusively to NSLS members. The Fall 2018 submission period runs from Monday, September 10, 2018 through Wednesday, October 31, 2018 at 11:59 p.m. Eastern Time. Click here to download the Scholarships and Awards Packet and begin your online application. We are thrilled to announce our guests for the Fall 2018 Speaker Broadcast season. The National Society of Leadership and Success partners with specially selected organizations who offer NSLS members tools to help them on their path to success. Partners offer significant discounts only available to NSLS members as well as connections and resources to help members in their future careers, including access to internships and job opportunities. In addition, some of these partners provide financial support to the NSLS each time members take advantage of these discounted offers. Save money and take advantage of NSLS partner offerings with Abenity. 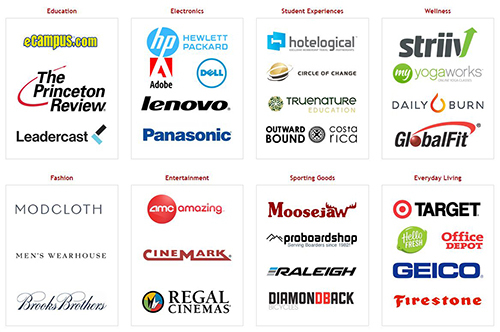 For the full list of partner discounts you receive as an NSLS member, please log into the Members Area by clicking here. For more than 230 years, Dickinson College has prepared leaders dedicated to making a difference and working toward the greater good. To help carry on this tradition, the college recently established a chapter with The National Society of Leadership and Success (NSLS). 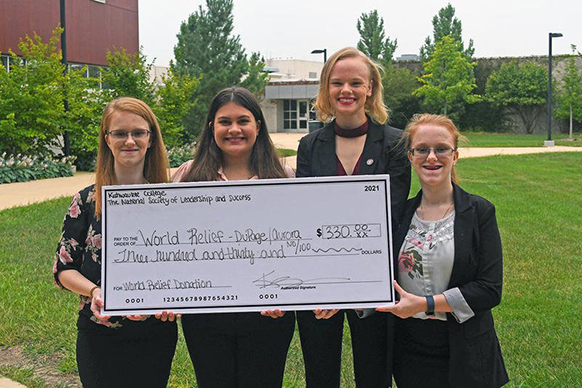 The National Society of Leadership and Success chapter at Kishwaukee College donated $330 to World Relief DuPage/Aurora on Aug. 20. The chapter raised funds through a spaghetti dinner event. World Relief Dupage/Aurora offers holistic services designed to promote local integration so that refugees and immigrants take root and flourish in supportive communities. Ever had that feeling of doubt that just pops into your mind when you need to think most clearly? Or that niggly voice that keeps whispering that you’re not good enough, or that you really don’t know what you’re doing, especially when you really need to stay motivated? Or you might be making fantastic progress until you start to question yourself, making it a bit more challenging to get going again. If so, you’re definitely not alone. We’ve probably all been there at some point or another, and although it might not be something that we openly talk about in public, it’s definitely happening behind the scenes.